Master of Ceremonies and Cherry Blossom Festival inspiration, philanthropist Jim Luce. 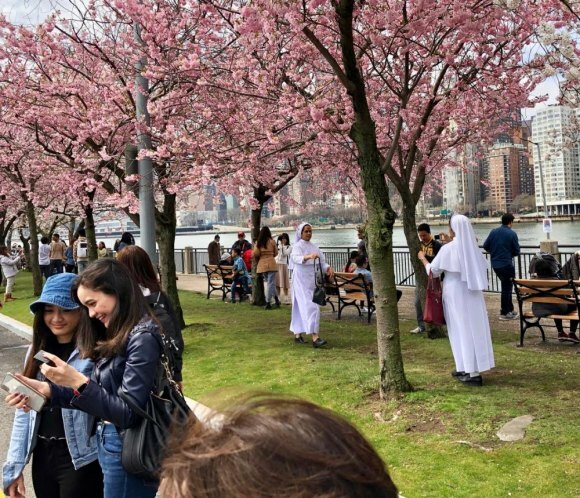 With cherry blossoms opening just in time and the best weather of the spring season defying forecasts, Roosevelt Island's 2019 Cherry Blossom Festival entertained and delighted, but by day's end, inevitable transportation shortcomings fed New York City media and Twitter storms feverishly dramatizing long delays getting on and off the Island. Arriving by Tram, visitors grabbed photo ops at the controversial RI Icon in the Plaza. By now, we all know that mass media thrives by emphasizing the negative side of life, and reporting on Roosevelt Island is no exception. 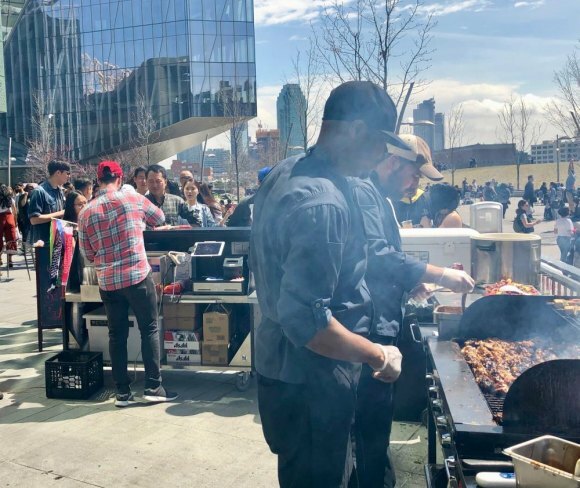 Most reports skipped the blossoms entirely, and not one could be found that mentioned a glorious afternoon of entertainment, deftly organized and well-performed in Four Freedoms Park. Accuracy? After noting on its website that it took one visitor 25 minutes to navigate the subway station, local NBC4 added, "Others chose to walk across Queensborough Bridge because it was too difficult to get on the subway." Really? Exactly how did they get up there? 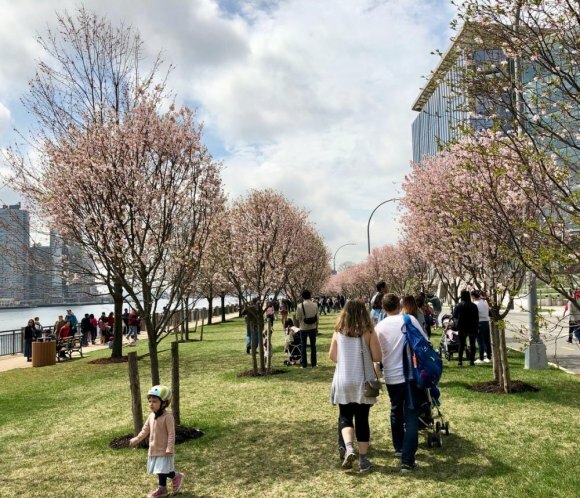 The Gothamist posted about "peak-blooms cherry blossom trees at Four Freedoms Park" (Hint: there aren't any. 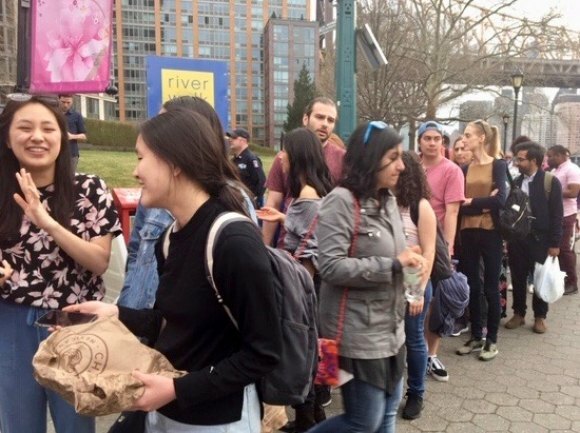 ), before reporting that "a chaotic logjam of people trying to visit Roosevelt Island—or leave Roosevelt Island—emerged." Maybe cliches are just too easy, but a logjam is the epitome of order, not chaos. 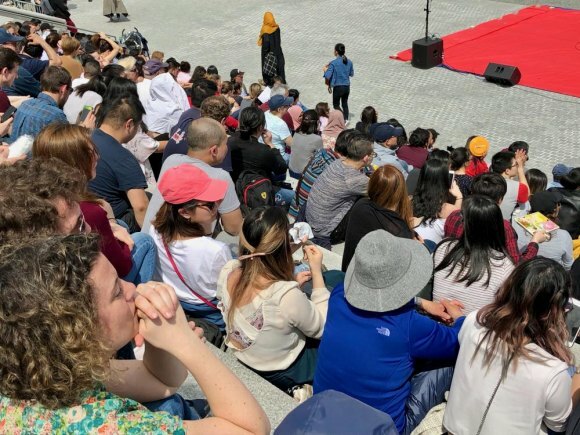 Performance audience filled the steps in FDR Four Freedoms Park. 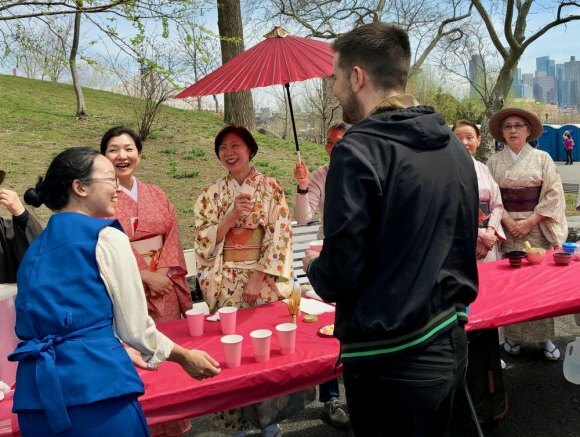 Tea Ceremony in Southpoint Park. Okay, so TV stations and and others don't assign their top talent to weekend duty, and much of the frenzy relied lazily on multiple Twitter feeds, but what about the event itself. No one, except those of us who were there seemed to notice. 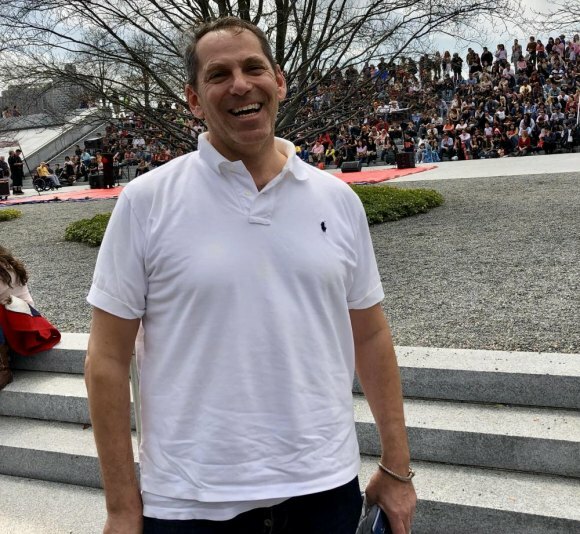 Four Freedoms Park Executive Director Howard Axel was justifiably delighted at organizers' success in attracting a satisfied audience. Looked at objectively, local officials along with the MTA did an exemplary job of managing crowds just as large as everyone predicted. Who expected to zip in and out without delays? But tales of "dangerous overcrowding" (Gothamist), "a nightmare for subway riders" (ABC7), "chaos at Roosevelt Island" (NBC4), and "congested nightmare" (New York Post) grossly misled readers and viewers over a predictable situation in which not a single injury was reported. Just delays. Geez, in New York City? 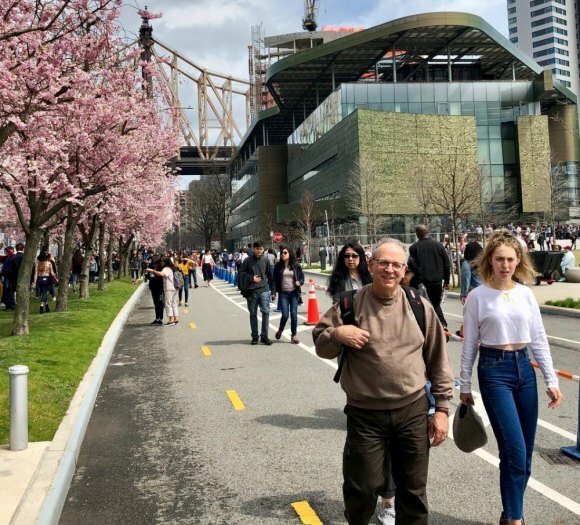 Thousands flocked to Roosevelt Island, and it's not news that we have a single two-lane bridge, one subway station, a limited volume Tram and an occasional ferry servicing us. If you were paying attention, you'd see RIOC's Red Bus drivers going hoarse patiently answering questions and directing passengers as well a would-be passengers. You'd have seen efficient security checkpoints guaranteeing that those entering were not a threat to anyone. 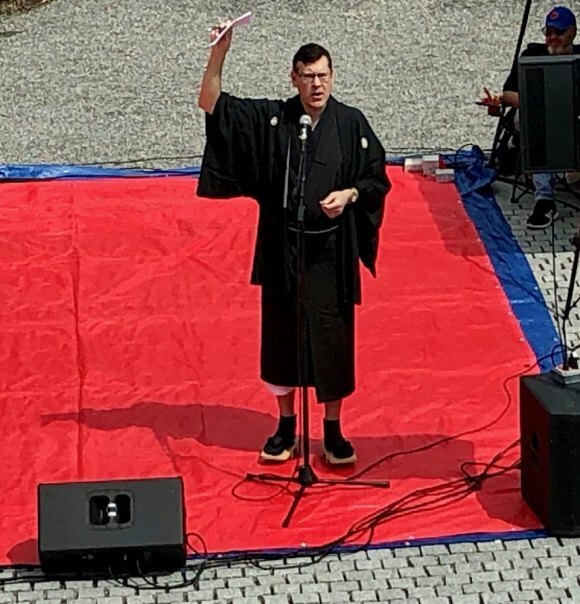 The orderliness inside was remarkable as were the performances in the park. While Twitter complainers griped about broken escalators -- there was one -- the reality was that MTA shut them down before they jammed too many riders into the small, street level entrance, an act that helped control movement through just four turnstiles and an exit gate. 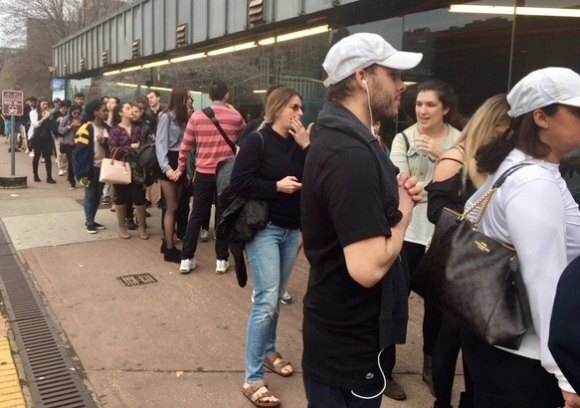 In a move most of us would appreciate happening more often, the MTA also rerouted R Trains through Roosevelt Island to help clear overcrowded platforms. Orderly lines for the subway backed up in both directions, far from chaotic. 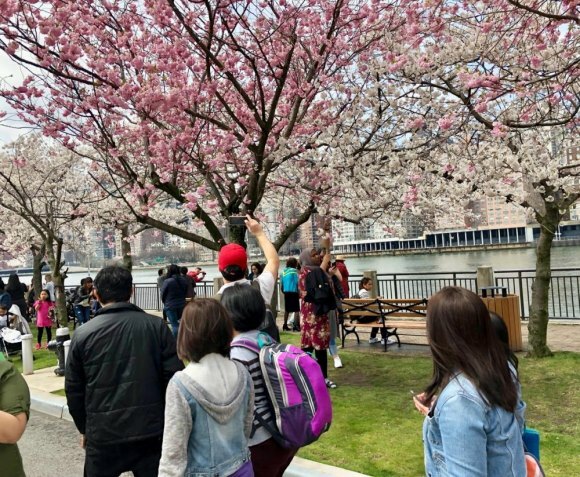 The 2019 Roosevelt Island Cherry Blossom Festival built on previous years' success by drawing record crowds. Too bad our mass media missed it.